The Multiracial Awareness Discussion Group continues its monthly exploration into our history of racism. 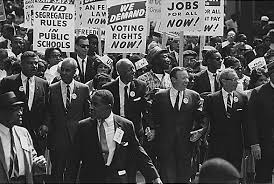 Learn about the influence the Civil Rights Movement had on our laws and our attitudes, then and now. Arthur Jones, a Charlestown resident, was deeply involved with the March on Washington during the Civil Rights Movement as a reporter and journalist. He will share his personal accounting of some of the more contentious moments in the battle for the Civil Rights Act. The Multiracial Awareness Discussion Group invites everyone to attend its monthly discussion meeting to better understand racial issues we face in our society today. Questions? Contact Lois Schmidt or Joan Green. See the Resident Directory in MyErickson for contact information.